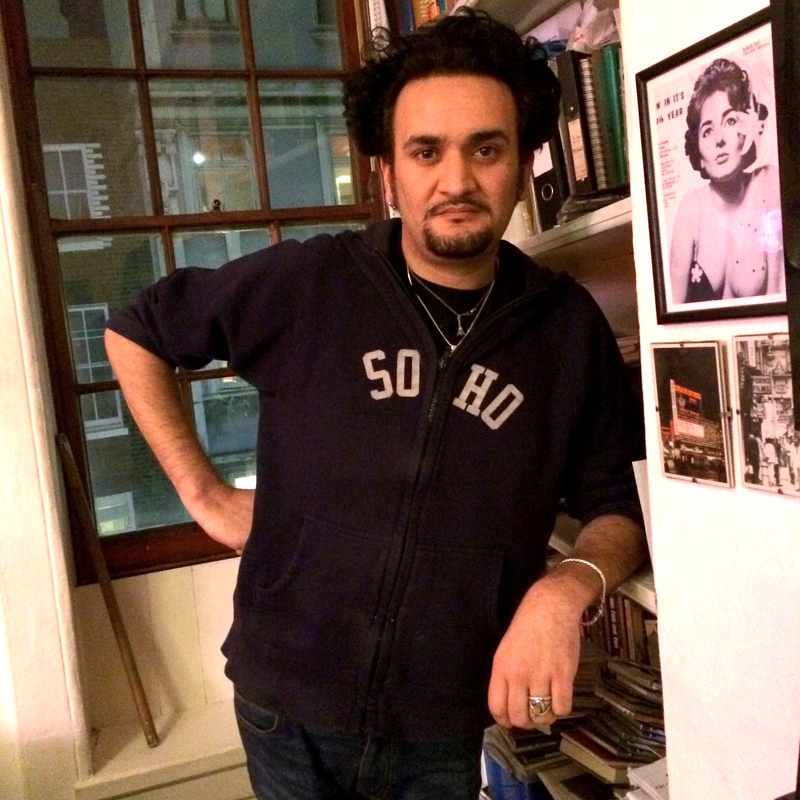 A couple of weeks ago, I blogged a chat I had with singer-songwriter Tim Arnold, aka The Soho Hobo about his Save Soho! campaign following the sudden closure of iconic Soho nightclub Madame JoJo’s. Tim was concerned not just with the closure of Madame JoJo’s but with a more general threat by property developers to the artistic nature of Soho. On 3rd December, he wrote an open letter to London Mayor Boris Johnson. The letter was also signed by Benedict Cumberbatch, Stephen Fry, Eddie Izzard, Paul O’Grady, Pete Townshend and a virtual roll-call of the British entertainment industry, as well as nonentities like me. Tim’s Save Soho! campaign publicised the general threat to Soho and got wide publicity, including a piece by the BBC World Service. I believe that culture is the DNA of this great city. People from all over the world come to Soho to enjoy its unique character and history – its performing arts and live music, its gay and transgender scene and nightclubs. As a place where people from all walks of life come together, Madame JoJo’s has been at the heart of this distinctive London “village”. I will be talking to the Leader of Westminster Council in the New Year urging her to protect the distinctive character of the area. 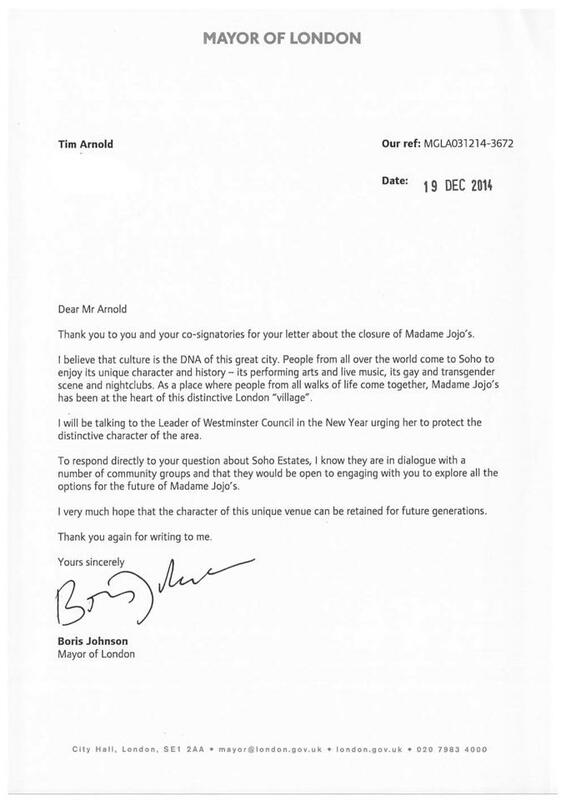 To respond directly to your question about Soho Estates, I know they are in a dialogue with a number of community groups and that they would be open to engaging with you to explore all the options for the future of Madame JoJo’s. I very much hope that the character of this unique venue can be retained for future generations. As a result of the publicity, Tim’s Save Soho! campaign has also now been given a place on Westminster Council’s ‘Soho Steering Group’. So sometimes – just sometimes – campaigns do work and ordinary people’s concerns can get noticed. Do not bet on it happening in other cases, though. YOU are NOT a nonentity! Happy New Year, John! !